Six years ago, Yacoub “Jacob” Najjar was one of two new department chairs in the University of Mississippi School of Engineering. With vision and dedication, the chair and professor of civil engineering accepted the challenge to build upon the solid foundation established by his predecessors and reach even higher levels of achievement. Najjar reflected on the department’s growth over the past few years. As examples, Najjar noted his civil engineering colleagues’ achievements: Cristiane Surbeck serves as president of the Environmental and Water Resources Institute of the American Society of Civil Engineers (ASCE); Waheed Uddin has been recognized multiple times at international, national and state levels; Ahmed Al-Ostaz has been named director of the newly established Center for Graphene Research and Innovation and as the leader of the UM constellation on disaster resilience. Also, Elizabeth Ervin and Hakan Yasarer have been picked to attend selective teaching workshops; Hunain Alkhateb is nationally known for her work on additive manufacturing and 3-D printing; and Christopher Mullen is an active member of the ASCE Engineering Mechanics Institute Objective Resilience Committee. “Even though we have achieved a good amount, I believe the department will realize more recognitions in the future,” Najjar said. One of Najjar’s goals was to create and maintain a happy civil engineering family by encouraging a collegial work environment. He said he believes that, too, is being achieved. Finally, Najjar wanted to align the departmental strategic goals with those of the School of Engineering and the university to efficiently serve the community, state and nation. The work of the CE faculty on this front has been “outstanding,” he said. Najjar said that securing ABET accreditation in 2016 for the maximum allowance of six years and passing the evaluation with a “clean sheet” has been the most rewarding experience for all in the CE department. Najjar received the 2017 CE Department Award for Excellence in Teaching from the ASCE student chapter, which he said was especially rewarding because his teaching contributions have been reduced since he became department chair. 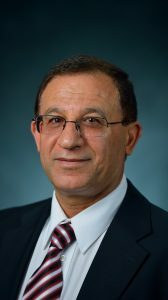 A graduate of the University of Oklahoma, Najjar served as interim chair and professor of civil engineering at Kansas State University prior to joining UM. His teaching awards and honors include the 2006 Midwest Section Outstanding Teaching Award from the American Society for Engineering Education and the 2012 Kansas State Commerce Bank Outstanding Undergraduate Teaching Award. Najjar’s research focuses on the application of artificial neural networks and computational mechanics to advance the civil infrastructure. His research on the interaction of soil and civil structures, transportation, geomechanics, geosynthetics and geoenvironmental systems has yielded more than 90 peer-refereed articles. Najjar and his wife, Oana, have three sons: Danny, 25, Adam, 12, and Noah, 10.